The Middle East: Revolutionary Change Foretold! 1. "I also discern with oracular help that you [President Obama] have bargained with the Pentagon to affect a compromise strategy. The generals prevailed upon you to receive their 40,000-troop increase, but you will counter putting the surge on a short time leash of 18 months." What Happened: During an interview with George Noory for Coast to Coast AM radio show -- a full month before President Obama began his strategy meetings with the top US Pentagon brass, Hogue detailed the Afghanistan troop call-up plan before it was even conceived, including the 18-month deadline for US troop withdrawals, and the troop surge increase of 40,000 soldiers into Afghanistan. 2. "I believe now the window of an overseas-based Muslim terrorist attack is closing as domestic jihad cells replace it. Added to this is a new terrorist danger arising in 2010...right-wing militias. The next great terrorist may be numbered among the angry and unemployable people. . ."
1. US Army Major Nidal Hasan upon conversion to a radical view of Islam went on a shooting rampage in Fort Hood, Texas, on 5 November 2009 that killed 13 and wounded 31. 2. On Christmas Day 2009, Umar Abdulmutallab, a Nigerian citizen with a U.S. multiple-entry visa, tried to light a bomb hidden in his underpants as Northwest Airlines Flight 253 made its final approach for landing in Detroit. 3. February 2010: a lone, Caucasian American -- an unemployed software programmer named Joe Stack -- flew his Cessna on a suicide mission into the IRS building in Austin, Texas, setting the structure afire. 4. March 2010: a terrorist plot to shoot crowds attending a policeman's funeral was foiled when BATF and FBI agents raided the Michigan based Christian Patriot Hutaree Militia. 5. May 1, 2010: Pakistani-born American citizen Faisal Shahzad unsuccessfully attempted to set off a car bomb inside Times Square, New York. 6. On the Day after Thanksgiving 2010, Somali-American student Mohamed Osman Mohamud drove a van filled with explosives into a crowded Portland Oregon square during a Christmas tree lighting ceremony. 3. "It will be reported in 2011 that a fault line in climate sustainability was breached in 2010 and thrust the global average of temperatures across the planet suddenly upward. " What happened: By July 2010, NOAA (The National Oceanic and Atmospheric Administration) confirmed a global temperature increase that was 1.22 degrees Fahrenheit above the 20th-century average. By December, NOAA announced that 2010 would go down as the hottest year on record since the 1880s; the farthest back modern global records go. The new Predictions e-Book from John Hogue, the man who in 2009 successfully predicted the passing of the US Health Care Bill for early 2010 when most forecasters thought it impossible. Read about what's happening in the Middle East now in the book written last year! (See pp. 34, 92 Predictions for 2010). John Hogue grasps the chaotic threads of time coming in 2011, and chronicles a year of destiny, when the old and familiar fabric of a now dying age ensnares a future that wants to break free. In this new e-Book Hogue draws a new future that favors the bold. Those who turn their attention away from the past can weave a new Lifeline to the Future, and according to Hogue, 2011 is the year individuals can begin redesigning the human dream and knit together an undiscovered new destiny. Are you ready? Read this book and find out. In 2011, systemic flaws become even more obvious in government. There is a counterfeiting of federal reserves in America and Europe. The time has come to fix these and other financial defects of Wall Street and Main Street, but if the world's economists and politicians remain stubbornly unreformed, time runs out! Watch! The systemic becomes sustain-ic failures in the next global economic crisis. Above: shot from around 21 February. 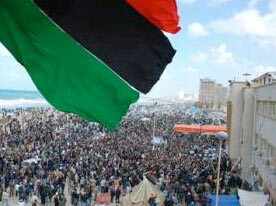 Celebration of freedom on beach in Benghazi under the tricolor of pre-Gaddafi regime. Source: Reuters. And yet. . . There are fewer wars than in centuries. Shared economic success is putting a stake in the heart of extreme terrorism. Expanding wealth in the developing nations creates a climate of hope and creativity in formerly war-torn continents. And a new era of middle class dynamism now stretches across the world thanks to an emerging, exciting, interconnected global society never before seen. Actions in 2011 launch and define the course of a new decade. Yet be warned. John Hogue foresees this window of opportunity closing. The date of the next economic crisis is foreseen in the book Predictions for 2011. Signs of how it can be prevented are also given. The gigantic American military industrial complex seeks a reason-for-being in new war markets. Peace in Palestine is coming sooner than anyone can imagine. So is war with Iran as consequence. The years for conflict are given. President Obama, like his favorite, President Abraham Lincoln, shares a critical need to see his fortunes change in "year three" of his presidency. The year 2011 is Barack Obama's 1863 - will he manage? A new Global Aristocracy makes its move to take over the US government of the corporate, buy the corporate, for the corporate. Will there be push back? Hogue introduces the idea of a a second American Revolution and when it's coming. 2011 is the year of military crises caused by failed states, such as Pakistan and North Korea. There's a war on. A war against stupid. "In 2011," explains Hogue, "we enter year two of World War Three, Mother Nature's war on us. This isn't some pagan voodoo threat. The natural world is ill. It's fighting back madder than ever in 2011. Her fever chills will bury us in blizzards this winter, her fevers will then suddenly rise hotter this coming spring and summer, her rages will redouble from what was seen in 2010." See how your corner of the world will be affected. Use Predictions for 2011 to set yourself free from the unraveling chaos of a dying age. You can 1. Read more Predictions for 2011 and see more content from the e-Book below. 2. Purchase the e-Book now. 1. This is the Chinese Year of the Rabbit. See how far the rabbit hole goes. . .From Beijing, all the way down into the pockets of politicians in Washington to influence and steal US elections. John Hogue is a modern day seer. He uses his own gift of future insight along with the geopolitical savvy of a Noam Chomsky to unravel the complex issues affecting us today. Voices such as these are needed in our times. John Hogue began documenting his own prophecies and interpretations of others in 1983. He released his first book "Nostradamus and the Millennium" in 1987. It sold 700,000 copies and was translated into nine languages. Seventeen books and 28 years later, his understanding of Nostradamus' coded texts, as well as his grasp of the art of prophecy itself, has deepened with experience, earning him the distinction of being hailed around the world as a preeminent authority on Nostradamus and collective prophetic traditions. Hogue's documented predictive track record into the new millennium has achieved an aggregate accuracy surpassing 80 percent. John Hogue has received wide international recognition appearing on over 100 television and 800 radio shows on four continents. His North American Television appearances include Ancient Prophecies Part I-IV (NBC and the Learning Channel), The View (ABC), Unsolved Mysteries (CBS), Prophecies of the Millennium (FOX), A&E's Biography-Nostradamus, Sightings (FOX/SyFy Channel), Ancient Mysteries with Leonard Nimoy (A&E), Nostradamus-A Skeptical Inquiry (Discovery Channel), The Other Nostradamus (History Channel), the Today Show (NBC), Nostradamus Decoded (Discovery Channel), and History Channel's The Next Nostradamus, Nostradamus 2012, The Nostradamus Effect and Brad Melzer's Decoded. His international appearances include television spots on CNN International and interviews on BBC World Radio. He is the author of 17 books-and-counting, with over 1,400,000 in print in 19 languages. 2. As Hogue predicted for 2010, the Hurricane Season was quiet in the Gulf of Mexico. The signs are changing in 2011. Prepare for the stampede of the worst hurricane season in the Gulf and along the Atlantic coast in five years. Find out the date when the next great Haitian disaster comes in Predictions for 2011. 3. 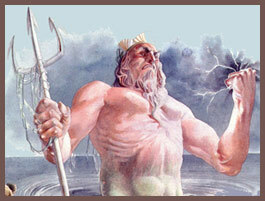 The planet Neptune (God of the Seas) returns to its home sign of Pisces in 2011. Prepare yourself for a year of great worldwide ocean storms, tempests and monsoons never before experienced in living memory. See if your town or city is in the cross hairs of superhurricanes. 4. The military junta of Myanmar (Burma) seeks to build an atomic bomb. North Korea will threaten to drop an atomic bomb in 2011. 5. Despite it's breathtaking growth, the People's Republic of China is a totalitarian society. 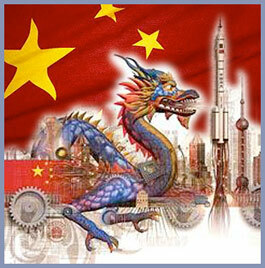 When China eclipses American influence in the coming decade, it will push a totalitarian agenda upon the world at large. It expects "you" to bend and bow to "its" authority. 6. Success in business and in life follows a path of an anti-hierarchical future in the Aquarian Age. Individuals work for mutual gain by free-associating and freethinking beyond the narrow and specialized mindsets of the dying Piscean Age. 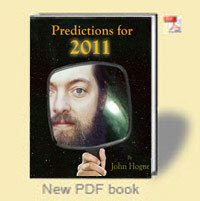 Hundreds more predictions can be found in Predictions for 2011. Be sure to include your email address on the memo line, so we can download this book to you. This item is a book download in PDF format. Best viewed with Adobe Reader. That means it is not a book made of paper. It is digital. Click the button below to go to the HogueProphecy Store to purchase. After completing your payment you will be shown the link to download your book in your account. You can return to download it for up to one week. 36,338 words, 137 pages, 39 color photos, graphics. PDF digital book for download. NEW! Also available on CD. Great for a gift idea. The same PDF book readable on CD. Just insert CD into your computer, and open and read the book with the PDF reader of choice (all computers come with PDF viewers now, we recommend Acrobat Reader). Portable Document Format (PDF) lets you view documents exactly as they were designed — from any application, on any computer platform (both Windows and Mac). The Adobe program for viewing PDF files is Acrobat Reader. (Download for free here).